Bedfordshire Horse Rides 8 at Marston MoretaineHorse RouteRide 8 in the Bedfordshire on Horseback series. 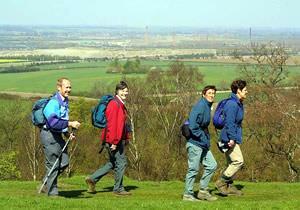 Approximately 11km (1 mile) and can be extended using Cranfield and Marston Thrift. Ride described clockwise and offers a mixture of flat, open terrain and hilly wooded terrain. From junction 14 of the M1or from Bedford follow signs for The Forest of Marston Vale from the A421 through Marston Moretaine. There is a car park at the Forest Centre. Start Description This circular route starts and ends at the Marston Vale Forest Centre car park. Ride 8 in the Bedfordshire on Horseback series. Approximately 11km (1 mile) and can be extended using Cranfield and Marston Thrift. Ride described clockwise and offers a mixture of flat, open terrain and hilly wooded terrain.